A glamorous stick for the fashionable cane user. The all-over pattern features the colours of a tropical jungle: vivid shades of green, yellow, blue, purple and pink. Hidden in the lush undergrowth are occasional, brightly coloured parrots. An unmissable cane for anyone with a taste for flamboyant fashions. 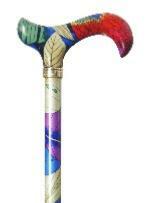 The derby handle provides excellent support and the cane is adjustable in height between 77cm-100cm (approx. 30"-39"). It is fitted with a non-slip rubber ferrule. Ferrule diameter 16mm.